Featuring high-quality wood, paint and metal this console cabinet will infuse your home with ample style and functionality. Four doors are fitted with iron mesh that has been oven treated in a rust colored paint. 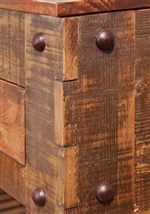 Solid pine has been hand distressed and wire brushed for an antiqued look. 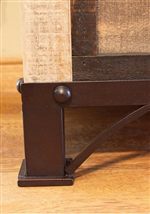 Completing the primitive style of this console is the hand forged iron base with bold decorative rivets. The 900 Antique Rustic Multicolor Console with 4 Iron Mesh Doors by International Furniture Direct at Gallery Furniture in the Oregon, Portland, Clackamas, Washington, Beaverton, Northwest, Vancouver area. Product availability may vary. Contact us for the most current availability on this product. 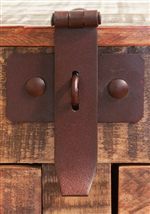 The 900 Antique collection is a great option if you are looking for Rustic Casual furniture in the Oregon, Portland, Clackamas, Washington, Beaverton, Northwest, Vancouver area. Browse other items in the 900 Antique collection from Gallery Furniture in the Oregon, Portland, Clackamas, Washington, Beaverton, Northwest, Vancouver area.